As soon as the Monarch caterpillar is large enough to be seen on a milkweed plant, it becomes a potential snack for certain bird species that are not affected by the toxins the caterpillar ingests by eating milkweed. As the caterpillar develops from first through fifth instar, its size and increased mobility make it easier for predators to see. I do not know which bird species snapped up all but one of the caterpillars that hatched in our garden this summer. As noted in a previous post, the California Towhee and other related towhee species like to eat Danaus plexippus caterpillars. Only about 5% of these caterpillars make it to adulthood in their natural environment. With that low survival rate, the abrupt disappearance of six caterpillars from my starter milkweed garden over the course of the summer was not unusual. At the fifth instar, Seven is eating voraciously, preparing for a final molt and the chrysalis stage. An abundant milkweed plant colony is a better way to ensure that a few caterpillars make it to adulthood, but that takes time with milkweeds that are native to coastal California. Colonies of Narrow Leaf milkweed (Asclepias fascicularis) develop slowly, and they go dormant for some time during the winter. Other native and non-native milkweed plants are available, and some of the latter are fast growers. I now have a favorite local supplier of a fast-growing, non-native but pesticide-free milkweed, Asclepias physocarpa. I found this plant at Matilja Nursery after many hours of searching for local sources of milkweed. Matilja Nursery and Annie’s Annuals both sell California-native plants including native milkweeds. Annie’s ships plants. The shipping cost is reasonable on multiple plant orders and they do a great job of packing the plants so that they arrive healthy. Should you decide to plant milkweed, be sure it has not been treated with pesticides. My suggestion is to avoid buying milkweed at discount or chain store nurseries. They may not know whether the plants they are selling are treated or not, much less what the plants were treated with. Sometimes the answer will vary depending on which associate you ask, not a reassuring result. For “big box” nurseries, first appearances and fast sales are more important than substance and quality. They tend to stock fast-growing and attractive tropical milkweeds such as Asclepias tuberosa and Asclepias curassavica…that are likely to be deadly with treatments. Pesticides kill caterpillars. Annie’s Annuals may be a good choice for purchasing tropical milkweed because they are upfront about a state-required plant treatment and plant establishment/cut-back recommendations. The eggs on the milkweeds I planted this year were laid by butterflies during the summer which meant that they were members of a local, year-round population of Monarchs. 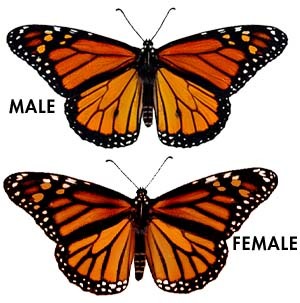 All generations of the local Monarch have an average potential life cycle of four or five weeks for egg to pupa stages, followed by five to six weeks as an adult. During the winter, coastal California hosts a migratory generation of the western Monarch that arrives, beginning in late October, from several states west of the Rocky Mountains. This special, long-lived generation begins the cycle again in the spring when it starts the journey back toward the western population’s summer habitat.